The US and three Nato allies have expressed concern over reports that a Muslim convert to Christianity could face the death penalty in Afghanistan. Abdul Rahman is charged with rejecting Islam and could be executed under Sharia law unless he reconverts. The US made a subdued appeal for him to be allowed to practise his faith - but stressed it did not want to interfere. Germany, Italy and Canada, which all have troops in Afghanistan, also voiced concern over Mr Rahman's plight. Mr Rahman, 41, converted 16 years ago as an aid worker helping refugees in Pakistan. His estranged family denounced him in a custody dispute over his two children. 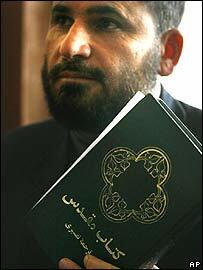 His is thought to be Afghanistan's first such trial, reflecting tensions between conservative clerics and reformists. Conservatives still dominate the Afghan judiciary, four years after the Taleban were overthrown, and Afghanistan's post-Taleban constitution is based on Sharia law. Speaking alongside Afghan Foreign Minister Abdullah Abdullah at a press conference in Washington, US Undersecretary of State Nicholas Burns urged Afghanistan to respect Mr Rahman's religious rights. 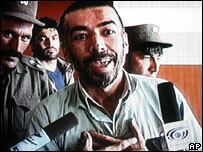 However, he did not ask for his immediate release and said he respected Afghan sovereignty. "Our government is a great supporter of freedom of religion," Mr Burns said. "As the Afghan constitution affords freedom of religion to all Afghan citizens, we hope very much that those rights, the right of freedom of religion, will be upheld in an Afghan court." Mr Abdullah in turn said he hoped "through our constitutional process there will be a satisfactory result". He said the Afghan embassy in Washington had received hundreds of messages of concern about the case from US citizens. The BBC's Jonathan Beale in Washington says the case has the potential to embarrass the US, which has invested huge efforts and resources in trying to help Afghanistan embrace democracy and freedom. US President George Bush only recently visited Kabul, praising the country's emergence from years of oppression under the Taleban. That message will ring hollow if individuals still face the threat of persecution for their beliefs, our correspondent says. The Italian foreign ministry has said that Mr Rahman's arrest is incompatible with the defence of human rights and fundamental freedoms. Officials in Berlin have also raised his plight, while German Cardinal Karl Lehmann said the case sent an "alarming signal" about freedom of worship. Canada has called on Afghanistan to meet its human rights obligations. Observers say executing a converted Christian would be a significant precedent as a conservative interpretation of Sharia law in Afghanistan.